Conservative plans to allow parents to set up schools with state funding have been called into question by two senior Tory council figures. Paul Carter, leader of Kent County Council, said funding parents to start their own "free schools" would threaten the budgets of other local schools. David Kirk - responsible for schools in Hampshire - said local authorities were better placed to improve schools. 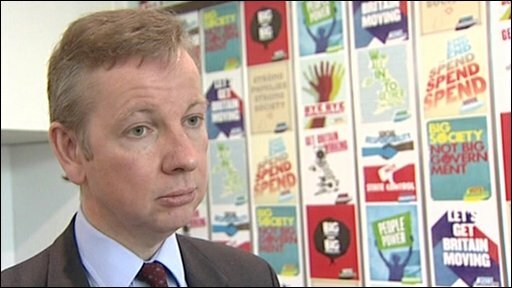 But shadow education secretary Michael Gove rejected any splits over policy. Councillor Carter later issued a clarification saying: "I am 100% behind Michael Gove's education plans, which will introduce more competition, give parents more choice and help drive up standards across the country." The Tories' flagship free schools policy would give public money to parents or other providers to set up their own schools. Mr Gove insisted the budgets of other remaining schools would not be adversely affected. And he said that the Kent council leader was making the point that "we do need to make sure we have fair funding". Councillor Carter had told the BBC that while he is in favour of the free schools policy, it could mean local authority schools get less money and that education services could suffer. He said he was not against choice in education, but warned his party must guard against what he called "destructive" rather than "constructive" competition. Councillor Carter, who runs the biggest education authority in England with almost 600 schools, voiced concerns about the funding of local authorities' strategic responsibilities. He highlighted how current spending on academies - and possible future spending on free schools - could divert money away from the local authority's education budget. "At the moment the more academies and free schools you operate, under the current academy funding arrangements, the less maintained schools would get," he said. "Secondary schools are around £4,000 plus per pupil. If 10%, 12%, 15% of that would be taken away from maintained schools and given to free schools and academies - local authorities still have statutory functions to perform. "They have to arrange and organise school admissions, statements for special educational needs pupils - a whole range or services that need paying for. "That can't be taken away from us and given to free schools or academies because they don't have the statutory duty to carry out these responsibilities." Councillor Kirk, cabinet member for children's services in Conservative Hampshire County Council, said he also wanted parents to have a choice. But he believes local councils must have the chance to turn schools around rather than giving parents or charities the immediate right to set up a new school. "The way we turn failing schools around is intelligent, sensible intervention by local authorities - to work with and assist the school to become successful," he said. "There still needs to be an opportunity for local authorities under any scheme of management to be able to intervene effectively in school standards because I do think a good local education authority has a major role to play in the raising of standards in its area." Another Conservative councillor who runs education services in one of England's cities, but who does not want to be named, says he "is not a fan of the free schools policy". He points out if parents were able to set up free schools in his area - a city with a growing population - it would make strategic planning a nightmare. 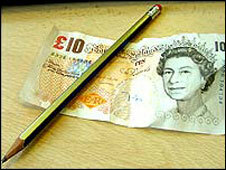 The Institute for Fiscal Studies, in an analysis of election promises for education, also questioned the funding. "How these new schools' start-up costs would be funded, where the money would come from, and whether this would mark the end of collective wage-bargaining for teachers, has not been made clear," it concludes. Labour's Ed Balls attacked the Tory policy for failing to offer any guarantee for the schools budget - claiming that the opening of new schools would mean cuts elsewhere. "David Cameron must now come clean about what his plans really mean. How will his new schools for some parents be paid for if not by cuts to existing schools and cancelled school buildings for everybody else? And why will he not match Labour's pledge to keep funding per pupil rising over the next three years?" said Mr Balls. He claimed that the overall school budget would go down by about £1bn a year under a Tory government. Liberal Democrat Sarah Teather described the free school policy as a "shambles". "Unless you give local authorities that power to plan and unless you actually make sure that there is money available... it's just a gimmick," she said. General secretary of the National Union of Teachers Christine Blower said "the introduction of 'free schools' investment will create chaos at local level". "Rather than providing opportunities to all parents, it will privilege the few at the expense of the many," she added.